Repsol has signed a deal with Brittany Ferries to supply liquefied natural gas (LNG) bunkers for a new ferry operating between the UK and Spain. The agreement will see storage and supply infrastructure built at one of either the port of Santander or Bilbao. 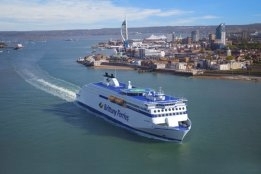 The operation will service Brittany Ferries’ new LNG-powered cruise ship, Salamanca, which is set to come into service in 2022. "Salamanca will be our second LNG-powered ship, but the first to operate to and from Spain," said Frédéric Pouget, Brittany Ferries’ Fleet and Operations Director. "This new terminal will allow for regular, flexible and reliable deliveries whilst Salamanca is alongside, benefiting our operations and scheduling." A final decision on the terminal's location will be taken later this year.